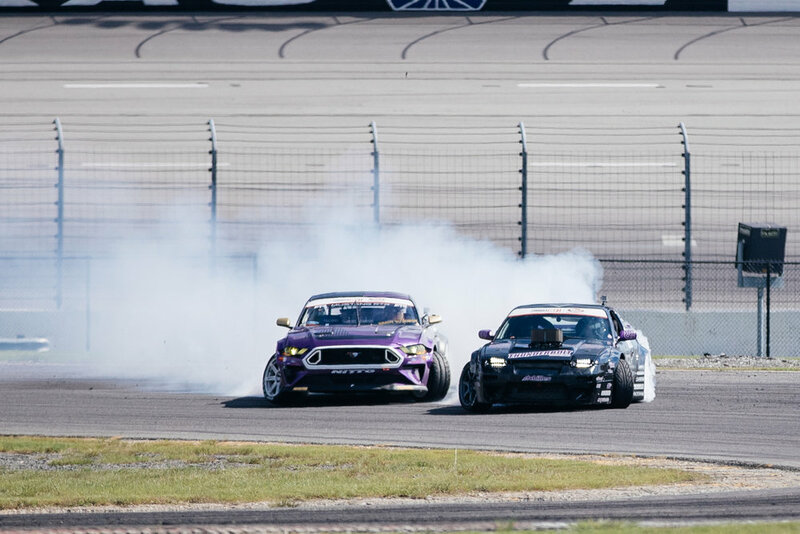 Formula Drift Round 7 took place last weekend in Fort Worth, Texas at Texas Motor Speedway. The Formula Drift track at Texas Motor Speedway is a high speed road course which Matt really enjoys driving. The team was ready for action after a frustrating weekend in St. Louis a few weeks prior. The team made the most of practice on Thursday and Friday, making sure that Matt was comfortable with the car and the track. The Achilles tires provide a lot more forward grip than our previous set ups and this allows for more confidence when approaching the outer zone with its notorious car eating wall ride. Matt's first qualifying run was off to a good start but at the second inner clip, he threw a little too much angle and wound up having to straighten the car to correct it which resulted in a zero. This meant the pressure was on for Matt's second qualifying run to make sure he had a score. Right before Matt's second run, a summer deluge soaked the race track. Matt is well trained for these adverse conditions and managed to score a 81 on his second run in the rain. Saturday, we were up against Chelsea DeNofa for Top 32. Chelsea is a good friend and had helped out tremendously when our car was having troubles in St. Louis. Matt and Chelsea ran a good clean battle, and Chelsea was awarded the win. Though it wasn’t the outcome we had hoped for, the team made the best of the situation and spent the rest of the weekend spectating and cheering on the other competitors. We would like to give a big thanks to all of our friends, fans, and sponsors who supported us this weekend. The team will be ready for battle at the final event of the season on October 12 & 13 in Irwindale, California.